Hmm. Sorry about that. Their site works for me but does seem rather slow. Edit: link to ufile.io redacted. Edit (2): BTW, I peeked inside the database file. I haven't read any documentation on this and I have no idea what the structure is expected to be, but a few things surprise me. First, instead of using a foreign key to the ARTIST table, each row in the SONG table appears to contain the artist's name as a string. Likewise for the ALBUM_ARTIST table. This makes me feel the table design is prone to inconsistency errors since the artist info is duplicated in several places. The first row in the ARTIST table is ([Missing Tag], Artist Tag Missing, [Missing Tag], ...), which I guess is what I'm seeing on the list of artists. If I execute SELECT * FROM song WHERE strArtistDisp LIKE "%Missing%", I don't find anything, so it seems like none of my songs have a missing artist. However, if I execute SELECT * FROM song_artist WHERE strArtist LIKE "%Missing%", I do see one result, whose idSong = -1. I don't know if this helps and my observations are pretty noob-ish, but there it is. Well, that is interesting. I can clearly see the [Missing] Tag as shown in the image, but it is a mystery for me where it is coming from. I think this one will have to be for @DaveBlake who is currently away, but returning in the next few days. He will be able to access the DB, if not he will ping me and I can pass it onto him. (2019-02-11, 07:13)mrob Wrote: he first row in the ARTIST table is ([Missing Tag], Artist Tag Missing, [Missing Tag], ...), which I guess is what I'm seeing on the list of artists. As a side note, your tags could benefit from a cleanup. Many Artists are duplicated due to accents, incorrect spelling or incorrect use of separators. Have you thought of running your files through Music Brainz Picard to correct the tags? Hey, thanks much for looking into this and for raising the issue with @DaveBlake. Let's see what he says. About the database, optimization for JOINs makes sense. Speed is important for sure. I also noticed lots of duplication in Artists table of my database. Does Kodi have a preferred format for songs with several artist credits, e.g., the examples you mentioned? I didn't know about MusicBrainz Picard, but an automated way to clean up the tags would be awesome ! I've been moving from iTunes to Kodi and doing lots of cleanup. Mostly using a tiny MacOS app called kid3. Helpful, but it seems aimed at manipulating only one album at a time. I guess what I'd need to do is clean up the mp3 files with Picard and then rebuild the music database from scratch(? ), though I'm not sure of the steps for that. You can add or remove items by copying that section to your advancedsettings.xml file then adding or removing entries. (2019-02-11, 08:26)mrob Wrote: I didn't know about MusicBrainz Picard, but an automated way to clean up the tags would be awesome ! Just make sure you select the correct album when using it. Some albums have multiple releases that look the same, until you realise that the song order is slightly different, or the bonus songs are missing, or there is no disk 2, etc. Okay, I'm "making it so" with Picard — pretty cool app ! You are seeing [missing] as an artist because one or more music files are not tagged with an artist. Kodi has [missing] artist entry so that all songs will have an artist and therefore we can avoid use of left joins which are slow. Not sure why you have a song id of -1, that is odd but I would sort out your tagging and start again with an empty db. Then see is the issue persists. Yes there is some denormalisation in the db, a common physical implementation, but I promise there are no data inconsistencies. The song table has an strArtistDisp field because you could have tagged it with a complex/decorative artist name e.g. "artistA (feat artistB)" and along with an ARTISTS and/or mbid tags that allow Kodi to identify the individual artists. Then Kodi can display "artistA (feat artistB)" during playback, but have both "artistA" and "artistB" separately in the list of artists. Kodi supports several ways of tagging songs with several artist credits. Historically it uses " / " space-slash-space as a separator for single frame tags (IDE v2.3), but not just "/" because of artists like "AC/DC". You can also use multiple frame tag formats e.g. FLAC file or v2.4 for mp3 to enter the multiple values. It also is Musicbrainzid enabled, hence using Picard to tag files with matched mbid and ARTISTS tags. Finally you can specify your own artist name spearators in advancedsettings.xml e.g. tell it to use ";". Take care here as some punctuation appears in individual artist names e.g. "Earth, Wind & Fire". Thanks much for these clarifications and tips. I'll continue the clean-up with Picard and then start again. Question: what's a safe procedure for starting from an empty db and rebuilding it? I guess I could just delete the file, but maybe(?) there's a lock or other dependencies. Afaik, you can just delete or rename the MyMusicxx.db to start from scratch. I think all righthtinking people in this country are sick and tired of being told that ordinary, decent people are fed up in this country with being sick and tired. Yes you can just delete the MyMusic72.db file, when Kodi starts it will create a new one (or try to migrate from earlier versions if it finds any). Then go you your music source(s) and "scan to library" from the context menu for each source. 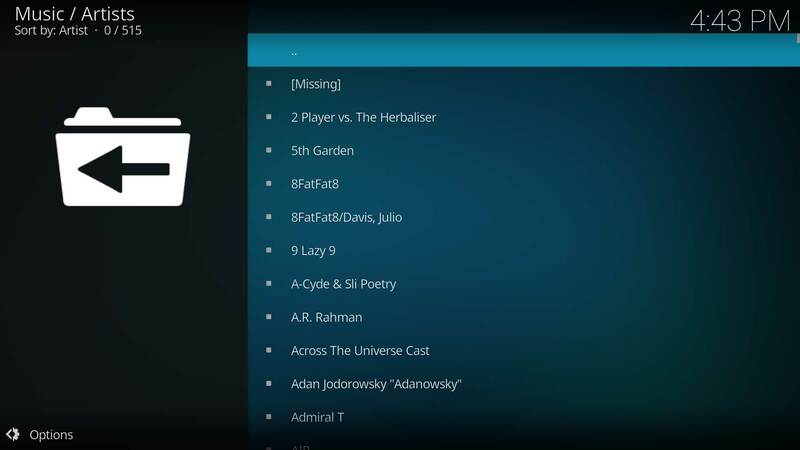 (2019-02-11, 11:28)DaveBlake Wrote: Kodi supports several ways of tagging songs with several artist credits. Historically it uses " / " space-slash-space as a separator for single frame tags (IDE v2.3), but not just "/" because of artists like "AC/DC". You can also use multiple frame tag formats e.g. FLAC file or v2.4 for mp3 to enter the multiple values. It also is Musicbrainzid enabled, hence using Picard to tag files with matched mbid and ARTISTS tags. Finally you can specify your own artist name spearators in advancedsettings.xml e.g. tell it to use ";". Take care here as some punctuation appears in individual artist names e.g. "Earth, Wind & Fire". For anybody else who might try this, it seems that support for genres is a new feature in Picard and disabled by default. I enabled it, but their database seems to be in early days. The Wikidata genre plugin for Picard is said to produce good results, but it uses "/" as a separator, while Kodi expects " / ". I agree with DaveBlake that this is preferable, to avoid confusion with band names like "AC/DC". I'll see what folks on the Picard forum suggest. Genres.... I recommend that you choose your own as those from sites are a notorious and controvertial mess. You will end up with a genre node with thousands of entiries, and then want a way to organise them hierarchically (there isn't one). So think about how you would categorise your music and apply that instead. Very helpful people on that forum, too! I had to fiddle with the settings a bit, but I got Picard to generate " / " separators to make Kodi happy. It's gonna be a slog to clean up my music library but Picard is the best tool yet that I've seen for this. I'll try rebuilding the Kodi music database and report back.